On March 9, in the Mother See of Holy Etchmiadzin, His Holiness Karekin II, Supreme Patriarch and Catholicos of All Armenians; received Mr. Nikos Kotsias, Minister of Foreign Affairs of Greece. He was accompanied by his delegation, and Mr. Karen Nazaryan, Deputy Foreign Minister of the Republic of Armenia, and the Ambassadors of the two countries. During their conversation, His Holiness reflected on the centuries-old friendly relations between the two nations, which serves today as a solid basis for effective cooperation between the two countries. 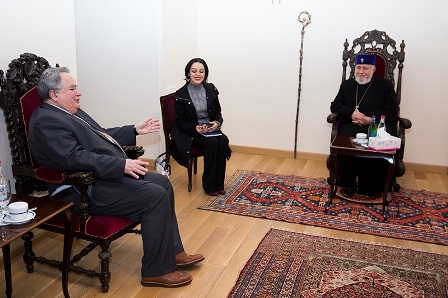 His Holiness presented to the Minister the historical role of the Armenian Apostolic Holy Church in the life of the Armenian people, particularly noting the difficulties faced by the Church during Soviet times, and as well as the current mission and challenges. The Catholicos of All Armenians referred to the brotherly relations between the Armenian Apostolic and Greek Orthodox Churches and the close cooperation between Greece and the Mother See, through which members of the Brotherhood of the Mother See continue their higher spiritual education in Greek Universities. Minister Kostsias spoke about the important mission of Churches in the life of the people. He stressed that the Church is implementing an important service, contributing to the preservation of national identity and moral values in society, and the spreading of a spirit of tolerance, solidarity and optimism. During the meeting, the Catholicos of All Armenians and Minister Kotsias also spoke on the tragic situation in the Middle East. Attending the meeting was His Eminence Archbishop Nathan Hovhannisyan, Director of the External Relations and Protocol Department of the Mother See. This entry was posted in News and tagged Armenian Apostolic Holy Church, External Relations, Greece, His Holiness, Nikos Kotsias by Orthodoxy Cognate PAGE. Bookmark the permalink.